When you are talking about the “slow recovery of whale population after industrial whaling”, then the emphasise is on “slow” rather than on “recovery”, depending on the species. All large baleen whale species where hunted intensively with industrially brutal methods in the southern hemisphere, mostly between 1890 and 1970, although whaling (mainly by Japanese whalers) is still an ongoing fact, as most readers will be aware of. Natural, pre-whaling populations were reduced to fractions. The actual size of the original populations can only be estimated. With today’s knowledge of reproduction, food resources etc., predictions of the future development of whale populations can be made. Of course, there are uncertainties inherent as with any model-based (or other) prediction, but some trends are nevertheless quite clear. Humpback whale in Gerlache Strait: back to a natural population size around 2050? Results vary, depending on the species, as a recent study by Australian biologists shows. Humpback whales may be back to a natural population level, estimated near 100,000 individuals, as “soon” as around 2050. Currently, there is only a third of that number around, but humpback whale cows may give birth to a calf every year and they are benefitting from a solid nutrition base. 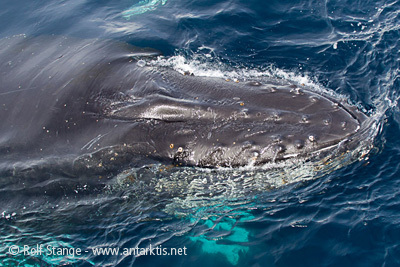 The larger species such as fin, blue and southern right whales will take more time. Their females five birth only once in 2-3 years. Recovery is accordingly much slower, and population levels may not be more than half of the original size in 2100, more than 100 years after whaling mostly came to an end. Factors like climate change and its influences on the marine food web and the potential threat of more whaling in the future bring additional uncertainty.